The year is 1948. Over 50 beautifully dressed ladies are at a ball at the Dominica Grammar School. This is no ordinary ball; it's a grand affair, a historical event. The air is thick with anticipation. The ladies are contestants in the first official Miss Dominica pageant. They don't know what the judges' criteria are, but they know one thing — this night one of them will be crowned as the first Miss Dominica. Ursula Etienne— 19 years old — and her three sisters are among the bevy of beauties at the ball. Ursula doesn't know many people there. She's just returned home from Antigua after several years. Looking back, the inaugural venue for the crowning of the first Miss Dominica generated quite a buzz throughout the island. Before that, a queen was simply randomly selected and bestowed with the title for two years. All that changed when Mable 'Sissy' Cauderion , a pioneering cultural enthusiast, suggested that the selection of the queen should be at a well organised, prestigious event. "What she decided was that they would have a ball and extend it to the island. So this ball was a New Year's Eve ball . . . everybody went to the ball," Ursula recalls. The ball was in full swing with lively music and dancing when the music suddenly stopped. The men were asked to step aside and the ladies were asked to form a circle and move around as the music resumed. "There was a line of judges in an area looking on. I don't know what they were looking for…One of them came up to me and said, 'Miss Etienne, please have a seat there,' " Ursula recalls. Thinking she'd been eliminated, Ursula sat down as requested. The ladies continued moving around in a circle. Each time the music would stop for the elimination of a batch of ladies. After the eliminations, festivities resumed. Ursula was sitting down not quite sure what was happening. Then, she heard the judges call her name — and announce her as Miss Dominica. Ursula remained seated as the announcement had not quite sunk in. And as far as she was concerned, she had been eliminated. She even looked around to see who had been selected. Soon, reality set in. It was true. Ursula Etienne was indeed the first official Miss Dominica. Dominica was a colony at the time and the colonial administrator requested the first dance with the newly crowned queen. Ursula remembers with some amusement that her gift as queen that night was a necklace of artificial pearls. One of her major assignments as queen was to play a leading part of the carnival parade. "We were supposed to imitate the queen's court with court jester and so on," she says. For the parade, Ursula was expected to dress lavishly and have a scepter and orb; but she had to finance the outfit and accessories herself. Back then, there was no concept of sponsorship. She also had to select a 'king' to accompany her at the parade. She chose Stanley Fadelle and he accepted. Ursula remembers that on the day of the parade she and her contingent were transported by the government launch to the old jetty opposite where the High Court is located. From there, they were driven through the streets in a decorated van owned by Clarence Signoret , which was the only van on island at the time. They then went to Windsor Park for the lavish crowning ceremony where ring-bearers presented the 'crown jewels' on sequined cardboard sprayed in gold. After the crowning ceremony, the group posed for photographs at a studio. After the pageant, Ursula moved on with life, albeit with the distinction of being known as the first Miss Dominica. She got a job with CG Phillip and later at the electricity company. Then she got engaged. Her fiancé FOC Harris had joined the civil service and was urgently needed in Montserrat in 1956. As such, her wedding took place there that same year. Her husband was an attorney-at-law and had many overseas appointments in far flung places like Cameroon, Malawai, Bahrain, Trinidad & Tobago, Antigua and Guyana. Ursula and her husband returned to Dominica in 1984. In her time away, she fully embraced family life and she had her hands full as she and her husband parented six children. Today, Ursula has settled quietly at Morne Bruce to enjoy her golden years in her homeland, sadly without her husband. She has aged gracefully and remains vivacious. She carries herself with quiet dignity and an elegant, regal bearing. That's why it's is easy to visualize her being chosen as the first Miss Dominica. It must have been an easy choice and the best one too. 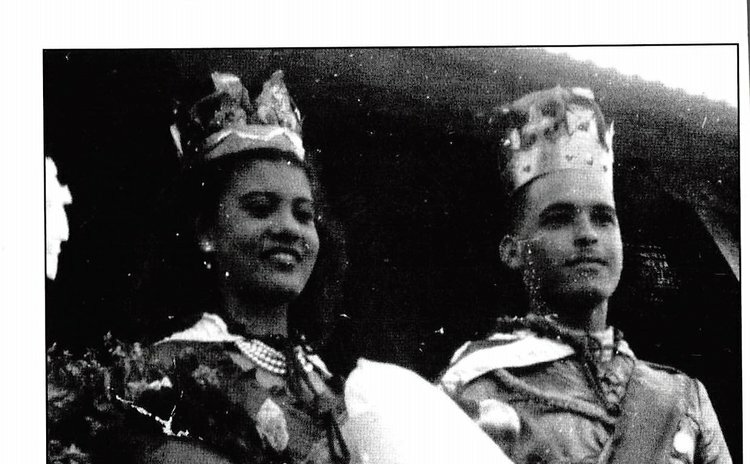 Dominica's first queen still reigns — long live the queen!